A Fylde woman who was a foster mum to more than 100 children has spoken of her joy awarded the British Empire Medal. Susan Jones was a busy foster mum for Cheshire County Council’s emergency placement team and became a churchwarden at St Paul’s Church, Ansdell after moving to the Fylde coast. There, she was instrumental in starting an outreach centre on Woodlands Road, where people could go for coffee and a chat and buy donated goods to raise money for the church. Susan has also worked closely with the Church of England’s Blackburn Diocese, which covers Fylde, heading a team parishioners in catering for clergy quiet days at St Paul’s. She has also been on the organising committee for the Diocesan Big Days Out held at AKS school, St Annes. She and husband Terry, who live in Ansdell, have three biological children and adopted three sisters – all now grown up – retiring from fostering after they adopted their last daughter. Susan’s award was announced in the Queen’s Birthday honours. 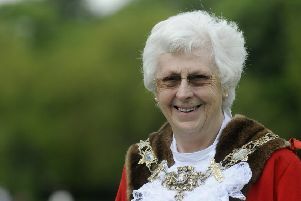 She said: “I’m delighted, although rather shocked when I received the nomination – and certainly humbled.